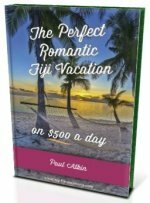 Time in Fiji - What is the time difference? Not sure what the time difference is? Find out here to help you plan for your trip. Also, what is this 'Fiji time' that people talk about? If it's to do with time and Fiji, it's on this page. This neat interactive world map has the default cities of Suva, Auckland, Sydney, and Los Angeles highlighted with the current times. All the yellow dots represent cities which you can hover, with your mouse, to find out the time. Don't forget, the current date and time is in the upper right hand column for reference on every page of the site. Fiji is 12 hours ahead of Greenwich Mean Time (GMT). Below is the conversions using Nadi/Suva at 12 midday/noon as the benchmark. Add one hour to the below time if that country has daylight savings. 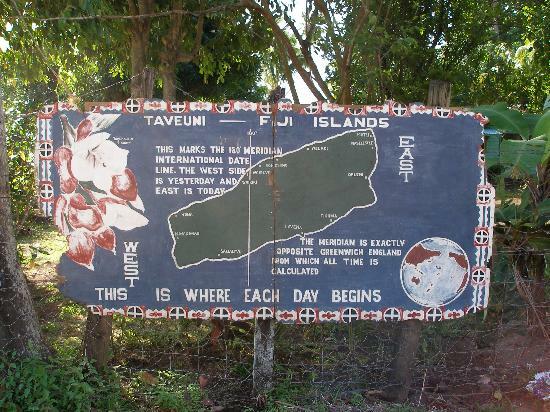 The 180-degree meridian cuts straight through Taveuni Island as the map in the picture shows. If you're staying on Taveuni Island, then it's just a 10-minute walk south of Waiyevo. If you're easily amused, then you can enjoy 'time travelling' from one day to the next. When you arrive in Fiji, 'Fiji time' will kick-in. You're in the tropics now, in island paradise. Everything is done slower, and even slower away from the main island. This is what makes Fiji so attractive, relax and take it all in. Adjust your thinking from from Western-thinking-time to island-thinking-time. Leave your watch behind, your western-efficiency, and your stress. They aren't needed. You're in a different culture, a different part of the world, so don't expect things to be done how you normally expect it to be done. Embrace your laid-back holiday/vacation, and especially the outstanding Fijian hospitality as things get done in 'Fiji time'... that is 'nothing gets done in a hurry', which always is accompanied with a warm friendly smile.